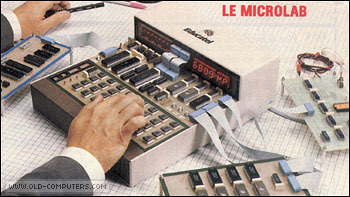 The Educatel Microlab is training computer used to learn/teach how the 6809 processor works. It was conceived (?) and used by Educatel, a french correspondence school, for their private courses. For this reason, this computer is pretty rare nowadays. As it was designed to show the user how the microprocessor works, there are red light indicators monitoring the CPU activity and functions. It is also possible to "slow down" the system and follow step by step the instructions being processed. Some hardware expansions were apparently available, such as an EPROM burner, memory expansions, printers and a RS232 serial board. It is not clear if this system was really designed by Educatel engineers or licenced from another manufacturer. see more Educatel Microlab Ebay auctions !